Checking in for Day 9 on my 70 Day Challenge– hold me accountable at youtube, pinterest, and twitter. I recovering from my 8-mile ordeal…funny how it was incredibly amazing yesterday and today its not feeling wonderful. Ever wonder why all the Speedo advertisements have these super lean in-shape people sporting their goods, or for that matter any clothing brand out there? Besides the image and body issues that the fashion industry and music, Hollywood and magazines push on us, they utilize our inner sense of beauty- symmetry and health. 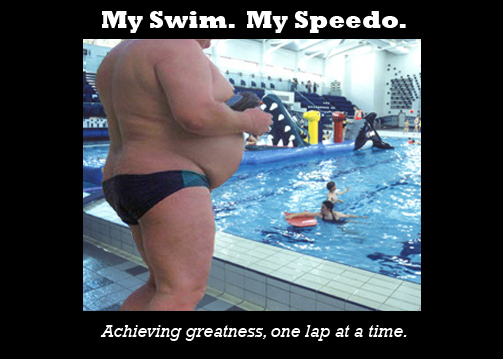 You will never find Speedo using the above graphic to advertise their product nor their brand. Like I mentioned before, throwing aside all the negativity that comes with what is being pushed on us today in the Hollywood-Fashion-Industry-complex the essence of the marketing suggest that society defines fitness as something in particular. When we see those images its meant to tug at the perception that a person needs to control, being in control also mean being in control of their body, and by extension in control of your health. I don’t want to promote the idea that I support the current advertising, because I don’t. Let me be clear the advertising has created some of the worst sorts of psychological problems for kids- eating disorders, depression, anxiety to name just a few. Social pressure and bullying based on the notions of fashion and advertising have created a monster of a challenge when it comes to the way we need to teach kids about health and fitness, versus the images of health and fitness are used to (hyper) sexualize, dehumanize and deconstruct social norms and behaviors that are for the most part necessary for a vibrant society. There definitely is a tension and I am not ignoring that at all when I am posting this. How do you balance the two? I don’t have an answer for that, but I do know that society and cultures over the span of history and geography have approached being fat differently. As I mentioned in my earlier post, at one time being fat meant that you had reached an elite status in nobility; in certain parts of Africa, being fat is a means of showing off ones wealth even today. The problem is with so much obesity, diseases that were once regulated to the “wealthy” few are much more wide spread, with even greater impact. A parents lifestyle choices- and by extension their health issues/challenges- are inherited by their children, not through genetic disposition but merely by being socialized to a unhealthy lifestyle. Normalization of bad health choices is the linchpin to hurting our national security. President Kennedy was writing this at a time when the GREATEST GENERATION OF AMERICANS ever to have come along were making their mark on history. We are talking about President Kennedy, who shortly after this speech launched the “New Frontiers” initiative that took us to the moon among other achievements. Imagine what that means if he were to look at us now. We aren’t “soft Americans”, he wouldn’t recognize us today, he would consider us to be “SAD FAT (OBESE) Americans.” I find that President Kennedy was spot on in terms of connecting the nations national security with the health and fitness of its citizens.